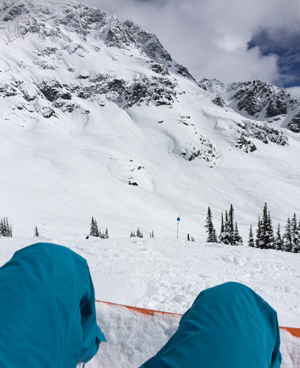 I recently took a personal day from my “real” job for a day on the mountain with my snowboard. Just a few days later, my S.O. and I headed to Mexico for an adventure with wind, wetsuits, and waves. And a week after our return, I tried road cycling for the first time. 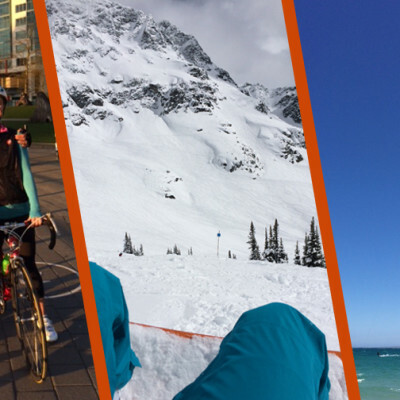 Like I said – life is good, and I love it when it’s full of outdoor fitness adventures! Curiously, while I was falling and crashing and flailing about during all of this, I had some epiphanies about learning and coaching roller derby. After all, falling, crashing and flailing is something we all once did, and we see a lot of with new skaters each season, amiright? Here, the 3 derby-applicable brainwaves I had while practicing these three very different sports. One of my sticking points with snowboarding has always been moguls. Few snowboarders love a moguls run, but I’m too competitive not to be “able” to take on anything on the mountain, or not to keep up with my skier friends, so I push myself down them here and there. I always seem to have trouble timing my turns. I don’t know what to aim for, I lack control of my board, and I wind up chickening out and sliding down long stretches of the hill avoiding turns. Lame-sauce. Instant improvement. Seriously. As soon as I started looking at where I wanted to BE, instead of that bump I wanted to MISS, my control improved by about 50%. 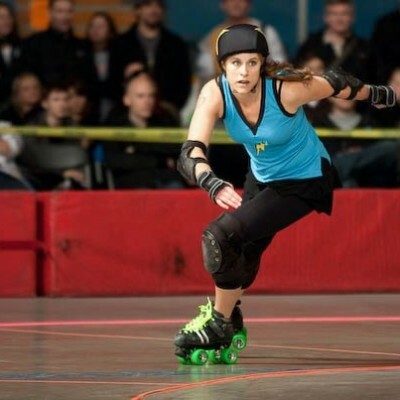 … Proving that roller derby training CAN be applicable to other sports for a change, and not just the other way around! Sometimes having dramatic success with a small modification is the reminder we need to trust the advice of our coaches and our brains. With just a little bit of focus, we can use those nuggets like “look where you want to go” and apply them to make significant improvements. It takes not just a desire to improve, but the applied effort to identify a weak area, assess the problem, and apply a small change. Then practice the crap out of it to make it stick. While delighted that I had made a breakthrough, I can’t help kicking myself for letting that small change in my riding go unattended for the past 7 years! 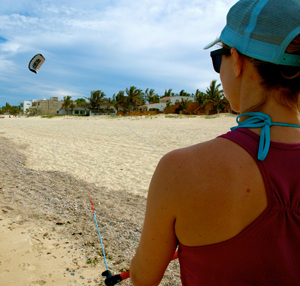 KiteBoarding – Watch and Learn (Patiently). Just about everyone who once windsurfed has now turned to kiting for their wind and water fix these days, and my S.O. and I decided it was time to see what it was all about. We spent 2 whole days of our lessons stuck on the beach with little baby kites, just learning how to use the wind and control the movement of the kite. Humbled, we watched dozens of pros and aficionados hit the bay and hurtle back and forth in graceful tacks at top speeds. We swallowed our newbie pride and kept practicing. So what’s the nugget of wisdom I’m driving at? It’s actually two-fold. Fold 1: As a complete neophyte to a foreign activity – be it kiting or roller derby – one must be humble. Don’t rush your progress, or you risk your safety. Don’t add “board” to wind+ocean if you can’t control just wind+ocean. Don’t attempt booty blocking if you can’t plow stop. Don’t join a scrimmage if you can’t yet transition quickly and change directions. Be humble, be patient, and keep working on the basics til you’re safe and ready. Fold 2: When you are a beginner at a new sport, carefully and methodically watch what the experts are doing. Starting out, I didn’t even know how the kite harness worked, how one controlled the kite, or what wind conditions were needed for kiting. So I listened to my instructor, and spent those beach-bound days carefully watching kiters out on the water to see how they launched and landed, and how they maneuvered their kites and boards. For derby newbies, this translates into taking time to carefully observe experienced skaters. Look how they position their skates and their bodies in different situations. What shoulder is she looking over? How is she using her teammates to her advantage? Author Tim Ferriss used this approach in the extreme to analyse video of champion male tango dancers, make a point by point list of what elements they all had in common, and then practice those elements. After just 6 months of training with this approach from the day he first learned the tango, he and his partner made the semifinals of the Tango World Championships. For roller derby, try this site, watch any of the dozens of quality bouts archived on WFTDA.com., or ask to observe your travel team’s practices. Road cycling – Celebrate small victories. 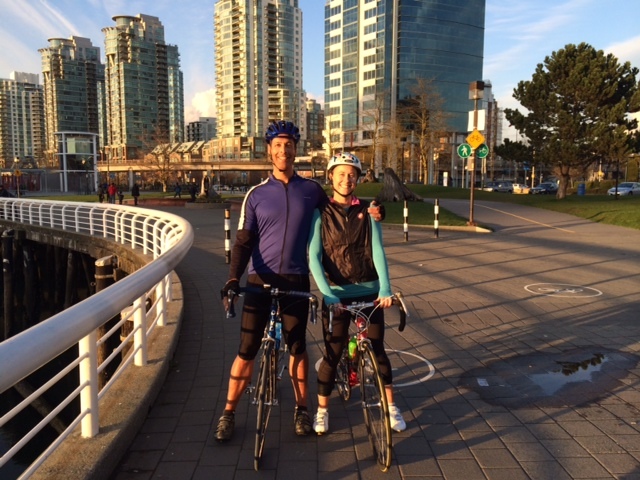 I am signed up to ride in the 200 km (125-mile) Ride to Conquer Cancer in June. It’s a fundraising event, and also a personal challenge to push my limits. Sure I’ve ridden a bike lots. Even on the road and in traffic (I am an avid fair-weather bike commuter!). But until just last week, I had never before ridden a proper (fancy!) road bike with clip-in pedals and bike shoes. Armed with a loaned bike and new bike shoes, I was ready to get started, with a helpful “coach” to help me get used to the new bike. After training ride #3, a group ride, I just about dislocated my shoulder patting myself on the back. 40 km, plenty of stoplights, and zero falls. I might just manage to nail this thing after all! The message: When you’re starting out, everything is new and you’re probably relatively terrible at this. Give yourself a break, laugh at your failures, but be sure to measure your improvement. Celebrate your successes! When you’re standing on the line at your first bout, look back and remember that time when you couldn’t even T-stop. OK – your turn. 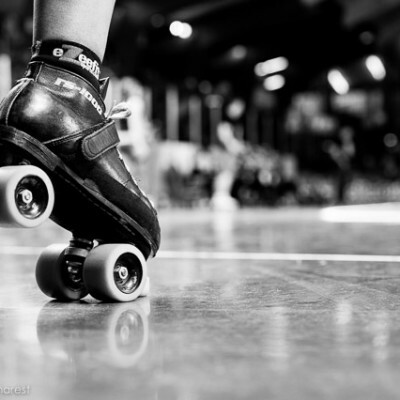 What lessons for roller derby have you learned from other sports? Post below, I’d love to hear from you, and so would the rest of the RDA community!